It’s my goal to help you have not only the healthiest body you can have, but a healthy mind and soul as well. Along the lines of my previous Giving Back campaigns, I’m pleased to announce a new partnership with Causely and Sweat Angels. Now, every time you check in to Fitness with Rachel in Goleta on Facebook, you’ll be helping to fund some incredible non-profits! In October, in honor of Breast CAncer Awareness Month, we’re supporting Bright Pink, which provides breast and ovarian cancer assessment tools to at-risk young women. 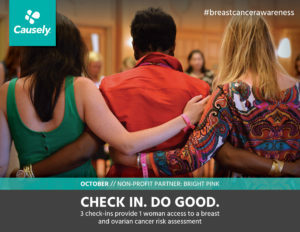 Just 3 check-ins provides a kit to one woman! The next time you come to the studio, remember to check in!